The investment in solar by Elon Musk and others is paying off. For the first time ... First Solar Inc. is making panels for less than China’s biggest producer, justifying more than $3 billion in loan guarantees from the U.S. government. After investing $775 million in technology, First Solar is producing panels for as little as 40 cents a watt, or about 15 percent less than China’s Trina Solar Ltd. In 2019, First Solar’s module cost could be as low as 25 cents a watt, according to analysts’ models. A solar energy company has announced a new project in Southern Illinois that will retrain former coal industry workers in renewable energy. Solar Alliance Energy Inc., based in San Diego, says it plans to build a 500 kW community solar generation and battery storage project in Southern Illinois over 2.5 years starting in 2017. The pilot project will include a workforce redevelopment program to provide skills training and jobs to 30 unemployed and underemployed coal industry workers. ...wealth distribution known as "basic income" or "universal basic income." Initially proposed in the 1960s, basic income's main goal is to reduce poverty by guaranteeing everyone a minimum salary just for being alive. Pizza delivered hot to your door, via robot! Starship's robotic couriers will pick up goods from a centrally located logistics hub or storefront and ferry them to homes within a 2-mile radius. Through a partnership with Mercedes Benz, the company is also experimenting with loading a bunch of robots into a modified Sprinter van that drops off bots along its route. 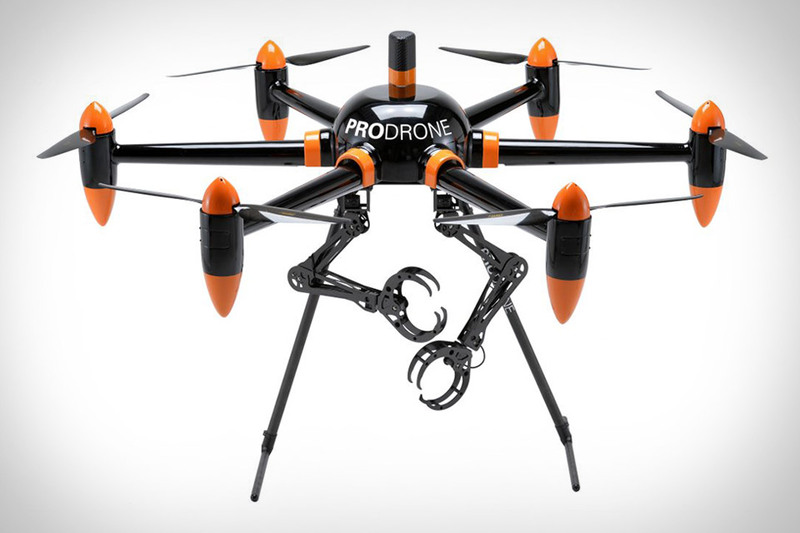 The Prodrone Robot Arm Drone can retrieve items, as well as deploy them. Based on Prodrone's existing large capacity airframe, this unmanned aerial vehicle has a pair of five-axis robotic arms that can perform a number of tasks, from picking up and moving objects up to 22 lbs., to cutting wires and flipping switches at altitudes — up to 5,000 feet — where direct human interaction is inconvenient or impossible. Capable of operating in nearly any weather, a human operator is still required. Over at the NYT, we read about reporters getting a look at Uber's autonomous vehicles on public roads, in the Pennsylvania city of Pittsburg. Uber's cars will likely learn [the customs of local driving] sooner than later, and I got to see examples of that learning on display in my drive. Apparently, when you're stopped at a red light in Pittsburgh, it's customary to let the first car across from you take a left turn if they need to before continuing straight through the intersection (it's called the "Pittsburgh left," appropriately). The autonomous cars thus are programmed to take a little pause before continuing through an intersection when a car across from it has its left blinker on. That's not about driving "right" or "wrong" -- it's about knowing local rules of the road and respecting them. Every area these cars go into will have their own quirky rules like this they'll need to learn. While sitting in the back of the Uber, I could look at an iPad mounted to show the riders some details on the car. You can see how far you've driven autonomously, the current speed and a graphic showing the movements of the steering wheel and when the brakes are applied. But most interesting was a view of what the car's radar system is seeing at any given moment. You can see cars, buildings, pedestrians and anything else in range of the car. It'll satisfy the curiosity of people interested in how the car works as well as provide some transparency and possible security to people skeptical about the system. For the first time Russian researchers have recorded a conversation between two dolphins -- Yasha and Yana -- who were talking to each other in a pool. An anonymous Slashdot reader quotes The Telegraph: Scientists developed an underwater microphone which could distinguish the animals' different "voices" [and] have now shown that dolphins alter the volume and frequency of pulsed clicks to form individual "words" which they string together into sentences in much the same way that humans speak. "This language exhibits all the design features present in the human spoken language, this indicates a high level of intelligence and consciousness in dolphins, and their language can be ostensibly considered a highly developed spoken language, akin to the human language... Humans must take the first step to establish relationships with the first intelligent inhabitants of the planet Earth by creating devices capable of overcoming the barriers that stand in the way of using languages and in the way of communications between dolphins and people." Communicating with drones that typically rely on WiFi is a conundrum for soon-to-exist delivery services and others. AT&T thinks it has a solution. The radio links or WiFi that enable control of unmanned aerial vehicles is limited in range to a few thousand feet, and aren’t reliable for control over long distances. Distributed computing in the cloud give customers the opportunity to take advantage of service oriented architecture in incremental amounts without the expense to obtain such assets. Cloud computing can be though of in three ways: Infrastructure as a Service; Platform as a Service; and, Software as a Service. Besides, this style of computing has a few fundamental arrangement models, specifically, open, private, group, and a hybrid. With every one of the open doors exhibited by distributed computing as a business procedure, there are in any case potential dangers connected with the procedure, particularly in the range of security. The point of this paper is to figure out if or not it is secure for organizations to use the administrations of distributed computing as a component of their every day operations to address the issues of their clients and to at last accomplish their business destinations. With satisfactory security controls established, cloud computing is a safe and effective option for organizations to use for their day by day operations. One such security compromise was the recent security breach of Apple iCloud. This was perhaps a talked about security breach following the unauthorized publication of personal photographs of American celebrities. However, after a thorough investigation, the accounts had been compromised as the result of a targeted attack on usernames and passwords. Duty regarding security in the cloud environment was an undertaking shared between the cloud administration supplier and the cloud client. In situations where outsiders are utilized, those gatherings will likewise be in charge of security of the cloud. Be that as it may, the cloud client has extreme obligation regarding information privacy, uprightness and access controls (as far as characterizing access parameters and levels of access for clients). The cloud client ought to guarantee that using a cloud administration supplier does not bring about security issues that may trade off consistence with laws and directions. In any business, hazard evaluation is essential in recognizing dangers, organizing them taking into account probability and effect and additionally outlining controls to relieve them.